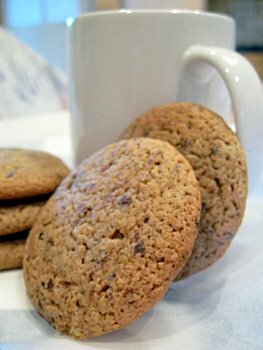 Â Blame it on the “super size me” world that we live in, but I’m a big fan of the site Pimp That Snack, where users create their own giagantic – a.k.a. pimped – versions of popular snack foods. Top ranked projects include the Creme de la Creme Egg, Giant Twix, Rubiks Cake and a McDonalds Apple Pie. Since I first started visiting the site, I’ve been tempted to do a “pimp” of my own. With so many great entries already up, it was difficult to choose what I wanted to make. This weekend it came to me. 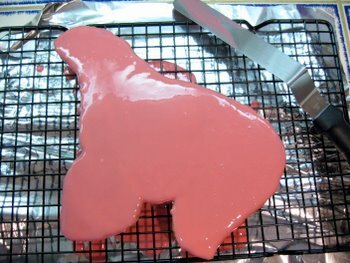 I decided to pimp a frosted circusÂ animal cookie. 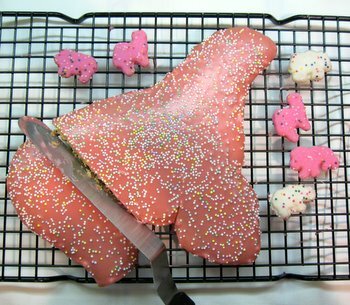 Made by Mother’s and Keebler, these are a perennial kids favorite, with a crisp animal-shaped cracker coated in white or pink frosting and topped with sprinkles. 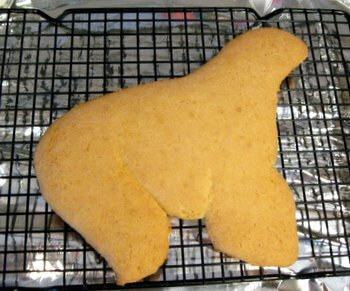 I chose to make a sea lion cookie (inspired by my recent trip) and based on the fact that I thought there was a sea lion in the circus lineup (apparently there isn’t anymore). I cut the critter out by hand with a sharp knife after rolling out the dough. Due to its size, the cookie didn’t get quite as crisp as I wanted it to, but still ended up tasting great and looking even better than I had imagined. I’ll have to work on scaling down the recipe for a small, crispy version before I post it here, though. 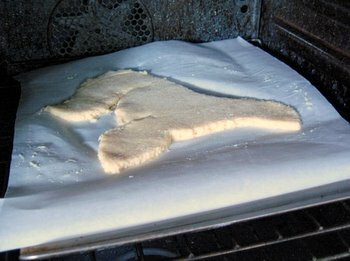 This is the unbaked cookie going into the oven. It held its shape really well! Fresh from the oven and slightly crisp. I let it cool before trying to frost it. This is the bottom coating. I used a thick simple glaze (powdered sugar, milk, vanilla, food coloring) and poured it over the bottom, spread it with an offset spatula and let it set up for a few hours. Then, I flipped the cookie and repeated, adding sprinkles to the wet icing. Finally, I sliced up my not-so-little sea lion and ate it. And, yes, I did share. I love it. 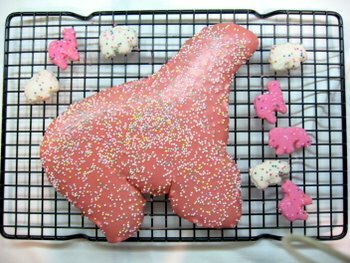 I’ve always been a huge fan of those frosted animal cookies. I love it!! Love love love it! I love those animal cookies and yours looks great! I think you need some bigger sprinkles though! I love that site. My favorites are the attempts to pimp a Scotch Egg. There have been some really creative attempts to create an artificial, giant egg. What a fun idea for a kids cooking session! That’s awesome! Pimping snacks definitely falls into my category of go big or go home! Yeah, when I made homemade ones of these the hardest thing to do was to replicate the waxy frosting…which I was never able to do. I love the jumbo sized one though, very cool.